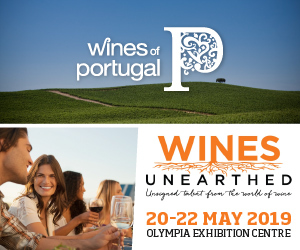 It would seem that Alentejo winemakers are good news for Portugal’s Macaronesian wines. Antonio Macanita (Azores Wine Company) and Paulo Laureano (consultant Curral Atlantis & Terras do Avô) are now joined by Bernardo Cabral, whom I met some years ago tasting the wines of Casa Santa Vitória. With effect from the 2017 harvest. 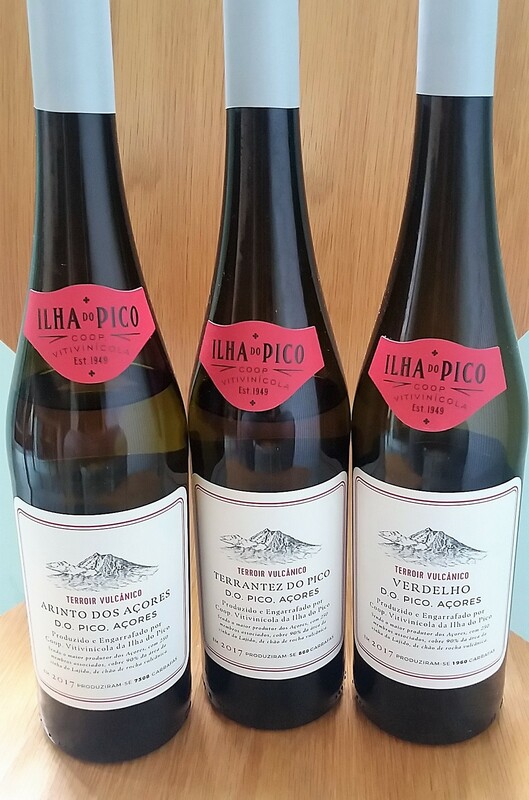 he was appointed chief winemaker at the Co-operativa Vitivinícola da Ilha do Pico (CVIP), Pico, the Azores. Since joining, Cabral told me he is “trying deeply to understand all the potential of each variety and their behaviour in different parts of the island.” As he points out, with 250 grower/partners, CVIP sources grapes “from every single corner of the island.” The winemaker is, he says, the first to have organised a meeting to taste wines with them. Adopting a “very minimalist” approach to winemaking, his first goal is “[B]ringing back the freshness from the sea and the unique volcanic influence.” Another aspect of his pursuit of this “terroir vulcãnico” is studying the microbiology of Pico’s terroir with a view to selecting an indigenous yeast that would be available for all Azorean producers. 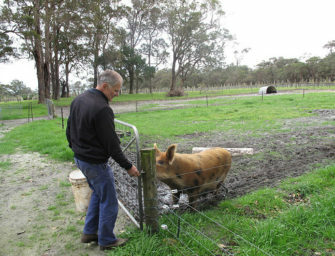 “[T]his could be a great thing for the wine style,” he reckons. The winemaker’s single varietal additions to the range reflect his approach of focusing on terroir, indigenous grapes and history. 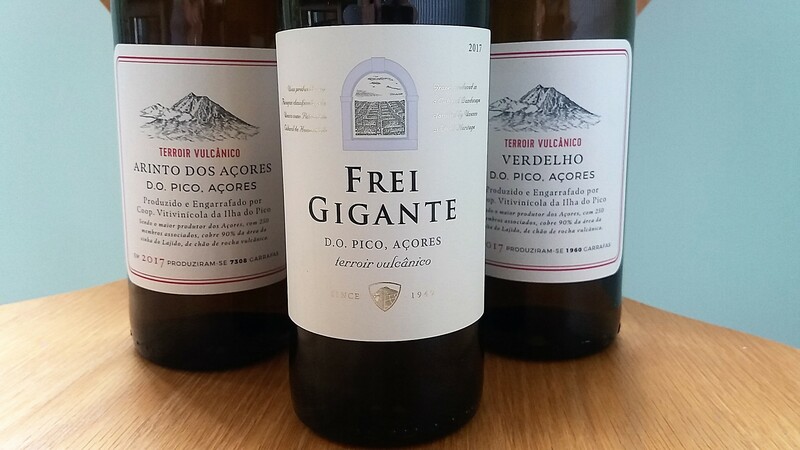 They are made from Verdelho, Arinto dos Açores and Terrantez do Pico, which leading Azorean grapes have been (and still are) blended for Frei Gigante – CVIP’s pioneering dry white, which was launched in 2003. Future plans include making a sweet Verdelho. Though he only started working at CVIP from the vintage in 2017, Cabral’s wines show an experienced, confident winemaker’s hand. They are cleaner and more sophisticated than other wines I’ve tasted from CVIP, with impressive balance and a polished, leesy mouthfeel. The Atlantic character – saltiness and freshness with body – a certain volcanic fatness/weight – is evident though, initially, the lees’ work mutes the acid and saltiness a tad, resulting in a certain homogenity. But give the wines time to open and, on day two especially, they had grown in the glass (always a good sign). Each variety asserted itself more. 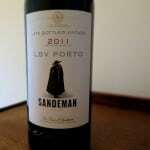 I look forward to following CVIP’s wines closely as Cabral deepens his understanding of the vineyards and varieties. 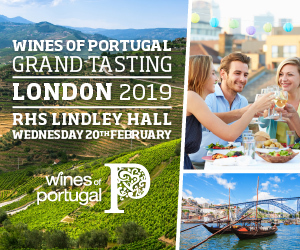 Perhaps we’ll see some single parcel wines, or sub-regional Pico cuvées? Meantime, this is an impressive start and I am deeply thrilled to see the archipelago’s biggest player show such an assured touch. Economies of scale are more achievable at CVIP, so it bodes well for the future sustainability of wine production notwithstanding the logistical, labour and climatic challenges associated with this far flung Atlantic archipelago’s location. 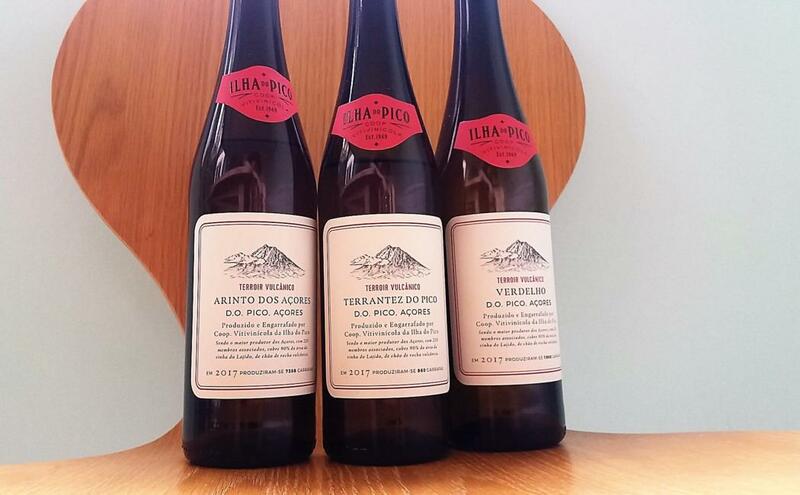 I understand that the Verdelho and Arinto dos Açores retail for €16 in Portugal and the Terrantez do Pico is priced at €18. 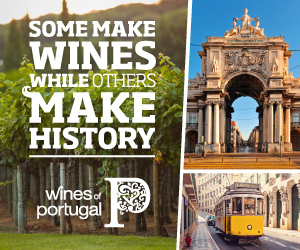 Verdelho, Arinto dos Açores and Terrantez do Pico grapes were harvested and cool fermented separately in stainless steel on fine lees for six months. Leads with a very saline, pure nose, with a focused lemony, citrine palate with riper hints of green pineapple fruit and a certain (volcanic-derived) fatness; fresh stone fruits as it opens up. Good persistence and freshness, with some phenolic texture (attractive) on the saline finish. 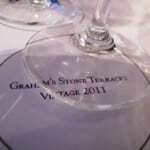 Purer and finer than previous vintages I’ve tasted. On day two, the saltiness seems more pronounced and I pick up some fennel and Terrantez do Pico herbal tobacco notes. 13% pH 3.4, TA 6.1, Residual Sugars 2.1g/l. A touch brinier to the nose. Creamy, salty lees (which I can imagine becoming nutty with age) make for a sophisticated palate with a slinky mouthfeel, without compromising this wine’s freshness and minerality. It shows grainy pear, star fruit, roast lime and salsify on a succulent, juicy palate, again, very clean but with textural interest and evident fresh, salty Atlantic terroir. Expressive and well-balanced, it is immediately very drinkable. On day two, it shows pronounced salinity and less fruit. Harvested in a quite short window – 1-3 September – this wine was fermented in stainless steel tank (80%) and old oak barrels (20%). It was aged for 6 months on lees. Harvesting: 1-3 september. 12.5% pH 3.5 TA 6.54, Residual Sugars 1g/l. Just 1960 bottles made. Azores Wine Company makes the only other straight Terrantez do Pico I know. It is sourced exclusively from another island, São Miguel. 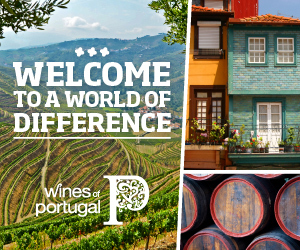 The variety is the rarest of the three lead grapes, though Azores Wine Company’s acclaimed example has encouraged others to embrace it. 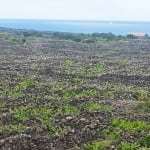 It’s great to see CVIP exploring it and shaping our understanding of the grape given the variety’s name suggests it was born on Pico island, whose barren basalt is very different from São Miguel’s older, richer soil. 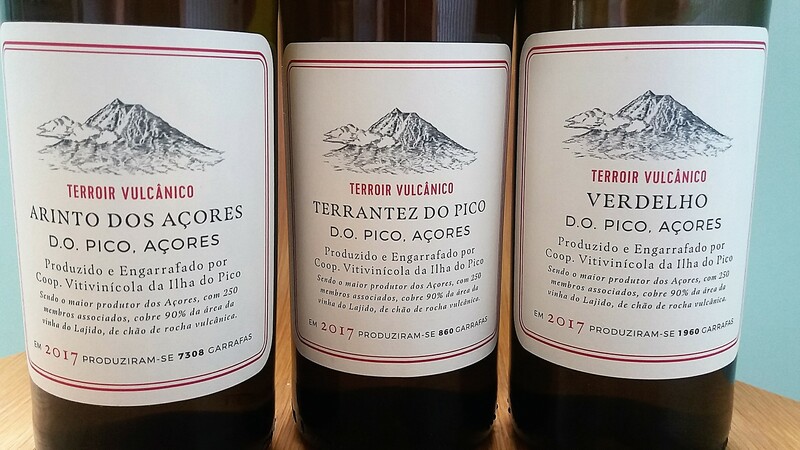 CVIP’s Terrantez do Pico is indeed very different from the Azores Wine Company example, but they share a touch of phenolics and drier vegetal/spicy (tobacco/fennel/earthy tumeric) profile. Perhaps because of the variety’s phenolics and/or the barrel ageing, CVIP Terrantez do Pico 2017 is a deeper colour than the others – yellow with gold glints, as opposed to pale straw. Long, with a leesy, textural finish, it has an ironstone mineral tang to the finish. On day two it seems more direct/fresh and less leesy with green (in a good way – nice bite) pineapple, deliciously shot through with earthy turmeric and brine. It’s my pick of the three single varietal wines. Interesting to see that this wine is harvested significantly later than the other single varietal wines – between 29-30 September. According to the technical fiche, it was fermented in a very old American oak barrels, where the famous Verdelhos from Pico aged (presumably a reference to the island’s traditional licoroso wines). It was aged for 6 months on fine lees. 12.5% pH:3.38 TA 7.49 residual sugar 1.5g/l. Just 860 bottles produced. 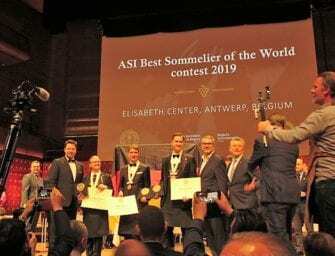 Click here for my notes on the Azores Wine Company’s 2017 releases and click here for links to my detailed coverage of the Azores’ wine renaissance, plus holiday tips in the Azores. 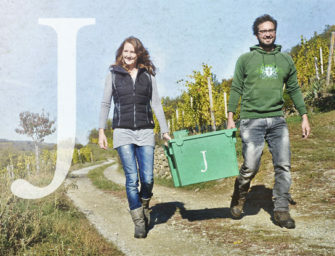 Can these wines be purchased from this newsletter?